F Simple and Serene Living: are your moods swinging? I remember when I went through puberty how often my moods changed. One minute I was on top of the world and the next it was as if my life was over. For the next 37 years I noticed that my moods were often governed by my menstrual cycle. Next came menopause, which I liked to refer to as reverse puberty. Now that I am long past menopause I wonder why my moods can't just be rosy all of the time. If you read my last post you know that I have been feeling moody and uninspired. I know that part of it is my current environment (living in less than an ideal situation away from my children and grandchildren), financial insecurity, and health problems. However, these aren't exactly new problems and so I often wonder why sometimes I cope less well than at other times. I know you are probably thinking to yourself, isn't Laura a counselor? Well yes I am, but we counselors have difficulties, too and we often go to see other counselors to help us. So I am going to go and talk about it to another professional, which is what I would advise you to do. Mood changes can be a symptom of other underlying conditions, either mental, physical, or both. They can also be a side effect of certain medications. In my case I think this is part of the problem as my ennui, so to speak, seemed to increase after they upped a medication I take. I've noticed, in many of your comments, that there are some of you who also are feeling uninspired and experiencing more depression. There is definitely an increase in depression during the fall and winter. Many people start to feel melancholy when the days shorten. For me as for many others, who suffer with Seasonal Affective Disorder, mid winter is an especially difficult time due to the lack of sunlight. I am aware of this and so I take steps to get more light at that time. The bottom line here is to be aware of your moods, don't be afraid to talk about them, and please seek professional help if you find you have new or worsening depression. Today I want us to talk about our moods. What do you notice about them? Are your moods changing as you get older? What do you do for yourself when you feel depressed or uninspired? The nights and mornings sure are cooler, so grab a warm cup of coffee or tea and let's chat. Sometimes my moods are all over the place. But that is part of my diagnosis. I take medication and it keeps me more on an even keel. But I avoid stressful situations, as most everyone does, because then it's an entirely different matter. I don't have any problem with the seasons or lack of sunlight. And could you see if you could make the text in this comment box bigger? I can't read what I'm reading. And I have new glasses. I have to squint and I still can't really read what all is here. It is always important for everyone to avoid stress as much as possible. It is good that the seasons don't affect you. I am not sure about the font being smaller. Mine hasn't changed when I type my comment in the box. I definitely don't think you are crazy. Just as the moon affects the tides, it also affects our moods, Laurie. I also agree with Laurie. We could always tell there was a full moon with the kids behaviors when I taught. I find my moods are all over the place and I also take meds. There seems to be alot of stress happening around me. Like yesterday. It was a good day and then evening came. I got a call from someone I never expected. It changed my mood for sure. Great post Laura, I always love that you talk about things that get pushed under the rug, we need to bring them out more, and let them see daylight. I remember the teen aged years...something that I am sure my Mom has blocked out forever, and good thing too. LOL. It is so difficult to point out to others the things that they do that drive us crazy. People in general don't react well to confrontation, but there are ways to do it that don't immediately put their backs up and turn it around on us. 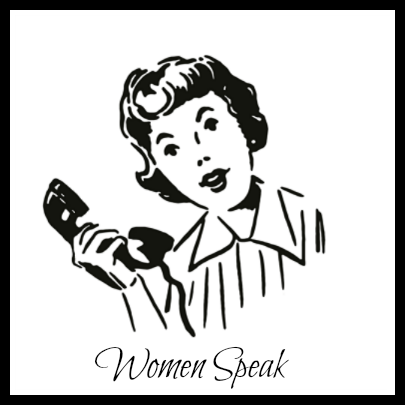 I think that would be a great discussion for a future Women Speak. I wish we could all get together in person for a chat, too. Wouldn't that be fun !!! Stress is such a factor in my moods. Now that my life is finally starting to settle into a better routine I can feel myself able to handle the stress better. I still have mood swings but I'm aware of them and try to see what factors contribute to them. I know my diet isn't great and I am taking steps to eat better. How can I expect my body to function well if I don't give it the right fuel. Great topic and always wonderful to discuss with others. Stress is a big factor in mood swings. I do not have the seasonal disorder but I think with the lack of hormones and my thyroid disease that has a lot to do with mood. Sometimes it can be just chemical imbalances too with other things going on in the body. Stress is a big factor in not just mood but the health effects on the body. So learning to deal with stress and how I react to it has been a great help for me. Ha ha I saw your comment on my blog about being a photo bomber with my garden bike. I could just see you know taking that bike for a ride around the neighborhood lol! You better put that bike under lock and key. You never know when I might pop up. Stress definitely has a huge effect on our health and our moods. I think it is one of the most significant reasons for disease. As I told Linda I am now meditating two times a day. That is helping me. Thyroid issues can affect your moods. They check mine regularly and so far so good. Thanks so much for stopping by my blog, Laura! My feelings come with the way I am or my daughter are treated by others. A couple of months ago I was severely bullied by someone working at the vet office. I talked back a bit then let it go. I have been friends with vet for years but no more. Last time I saw him he was mean and nasty. I won't go back. I cannot go into to detail here but be careful out there people are oh so strange. Even the ones you have known for 30 years. It is hard for people to handle a dwindling economy, and many other things going on around the world right now. I believe it makes them act out of character. I stay home more, cook more, and would like to sew again to keep my hands and mind busy. Sure hope we all get better soon. I have my moments of moodiness too. I'm in perimenopause and will soon be in menopause so I'm sure I'm experiencing mood swings due to my hormones shifting. I am affected by the weather too. I hate the dreary grey cold winter days coming! I'm glad that we don't experience it for as long as people in other regions though. Guess I better stay in the south! I also don't like rainy days for days on end. I feel lethargic without my dose of sunshine. Getting out of the house helps me a lot when I'm feeling down or bored. Just a simple change of scenery can do wonders. I'm with you, Kelly. The weather really affects my moods. I love getting out in the sunshine and sometimes it is just good to have a change of scenery. Honey, I am with you on all of the above. Financial reverses are the greatest cause of depression and in my case, marital problems. But sometimes with Bipolor, as you know, there doesn't have to be a reason. I'm about to go back to the therapist that my son saw 20 years ago whom I have used over the years. You do what you have to do. I too have been in a blogging slump. I go to read my blogs and I just don't feel up to. My house is a mess which is not like me. I'm in a slump and contribute it to not being near my children and grandbabies If I didn't have a husband, I'd go where my babies are. I even told my daughter I may move and leave him here when her baby gets here. (Probably not) but I sure have thought about it. Hang in there. Vent. It feels good to have a safe place to do that. This is mine. I'm usually upbeat, and can't say that as I've gotten older, I've gotten moodier. However, there are certain things that when they aren't going right, really bring me down, especially when they all seem to come at once. At those times, I can't seem to get anything done, and I find it really hard to write my blog posts when I'm feeling low. I hadn't really experienced SAD until last winter, which was so miserable. A sunny day does cheer me up, though! I also feel a little down when days are shorter. I celebrate every year the winter solstice as after, the days get longer!